Medieval man believed in the power of bones. The bones of saints were revered, collected and even fought over by churches and monasteries because they were believed to effect miracles. A church or monastery which had the relics (bones or other remnants) of saints could expect to collect much money in the way of alms of the pilgrims who came seeking miracles. This "Morbid Taste for Bones," sets the scene for the first of Ellis Peters' Brother Cadfael Series. Cadfael is a monk at the Abbey of St. Peter and St. Paul in Shrewsbury during the twelfth century. He has come late to the cowl, having served the Lord as a Crusader in the Holy Land for many years. Thus he is more worldly and less naive than many of his monastic brothers. As the herbalist for his monastery and the surrounding area, he has more freedom of movement than most monks of his order. 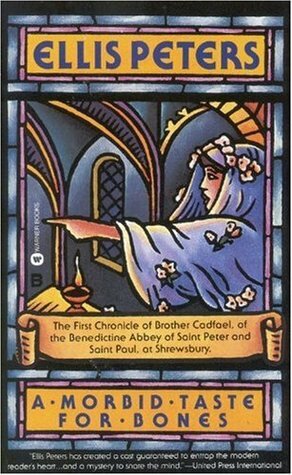 In this first of twenty Brother Cadfael novels, he is chosen to accompany a group of monks on a trip to Wales to recover the bones of St. Winifrid. Winifred is a Welsh saint who died and was buried in Welsh soil, and Cadfael has his doubts about the mission. One of the brothers in his monastery, Columbanus, has had a vision that St. Winifrid wants her bones brought to their monastery. Cadfael is chosen to go on the journey because he is Welsh and speaks the language. As Cadfael expected, the Welsh villagers of the town where Winifrid lived and is buried are not happy that English monks have come to claim their saint. When the major landowner of the village, who strongly opposes the monk's mission, is murdered, the brothers are blamed. Now Brother Cadfael needs to appease both sides and find the true culprit. Several false leads initially take him astray, but in the end Cadfael brings about a somewhat surprising, and amusing, end to the tale which leaves everyone happy, but some in the dark. This initial Cadfael mystery introduces us to the clever and wise, yet down to earth monk who has an understanding of the true meaning of humility as well as charity. This page was last modified on 18 January 2018, at 19:14.